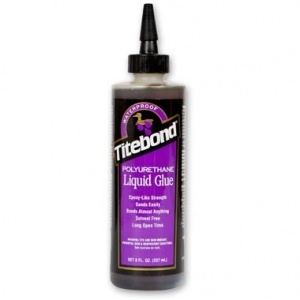 High strength waterproof glue specially formulated for multi-purpose applications. In addition to its superior wood-to-wood performance, it is equally effective for metal, ceramic, plastic, Corian, stone and other porous/non-porous materials. Ready to use, offering excellent sandability and unaffected by finishes. Thicker than traditional polyurethanes it provides a non-running, non-drip glue line for more precise applications. Polyurethane glues cure by moisture and an effervescence is a by-product of this, there is no strength in this and it is easily sanded off when dry, the glue will not become brittle with age and will not expand or contract in the joint. In very dry timber it may be necessary to moisten one surface to encourage curing to take place.